It's axiomatic that the best blues performers tend to get improve with age, and this time we have another excellent example: a guitarist and vocalist who has been on the scene for a quarter century now, but someone who probably still gets called a youngster by some of the seasoned veterans of the blues. His name is Duke Robillard, and his new album, which is something of a homecoming for him, is called Duke's Blues. Robillard is probably best known for the two years he spent with the Fabulous Thunderbirds, one of the main groups that help to kindle the current blues boomlet. In 1990 Robillard replaced Jimmie Vaughan who left to form a band with his brother Stevie Ray, just before the latter's death. But Robillard came to the T-Birds with an excellent reputation and track record before that. Growing up in a small town in Rhode Island, Robillard was first turned on to blues and rock & roll from his older brother's record collection, with Buddy Holly and Fats Domino being special favorites. He would secretly practice on his brother's guitar, while his parents did not want him to get too serious with the music. He eventually got his father to agree to help him build an electric guitar as a science project. Of that ruse he says, "I won second prize at the science fair, and I was in a band a week later." After graduating from high school in 1967, Robillard founded Roomful of Blues, a Providence, Rhode Island-based group that survives to this day, and remains one of the finest bands specializing in Forties and Fifties-style big-band R&B. Roomful of Blues recorded its first album in 1976, and Robillard left after one more record in 1979 before setting off on his own with his group The Pleasure Kings, and working as a sideman on many a recording date, and backing touring blues masters. He also was part of two LPs by the Legendary Blues Band, Muddy Waters' former group. One of Robillard's strongest suits is his versatility. He easily moves back and forth between the hard-driving blues-rock of the Fabulous Thunderbirds to 1940s-style swing-band sounds. In fact he seems to alternate between rock-influenced projects like the Pleasure Kings in the mid 1980s or his previous album from last year, and records that recall Louie Jordan and even Count Basie. In 1986, he collaborated with fellow Providence native jazz saxophonist Scott Hamilton for an album called Swing, and a couple of years ago followed that up with After Hours Swing Session. Now he is back with Duke's Blues, which for those of us who fondly remember the early incarnations of Roomful of Blues, will be a special treat. By my way of thinking, it's probably Robillard's best solo album. It puts him back under the influence of the period when big band swing was starting to evolve into R&B and the earliest rock & roll. And it marks a return to Robillard's Providence roots, with musicians from an area that has quietly provided a lot of outstanding players. The guitarist writes at length in the CD booklet about the Providence music scene and how he had wanted to draw on musicians from the region, and to make the recording there as well. Robillard plays with his current band, which includes drummer Jeffrey McAllister and acoustic bassist Marty Ballou. For the first time in his own group, Robillard employs a rhythm guitarist, fellow Providence-area native Paul Murphy who really understands the old-fashioned concept of rhythm guitar in the tradition of Freddie Green who served with Count Basie for decades. They are joined by pianist Matt McCabe and three horn players for many of the tracks, whose arrangements and performance can really sound like a wonderful time warp back to the late 1940s. In addition to some original tunes, the album draws on composers from the era of early R&B, paying tribute to some of Robillard's influences. The styles range from more electric blues approaching the Fabulous Thunderbirds sound, to swing tunes with the horn section reminiscent of Count Basie; from classic-style slow blues to great jump-band tracks; from shuffles to rockabilly. It's a generous nearly 70-minute, 15 track album that hasn't got a weak tune on it. Along with the great variety of styles, all played with the right spirit, central to the record is Robillard's remarkable guitar playing. At first he does not seem to be a flashy player, but what he can do on a solo -- his wealth of musical ideas and his level of taste -- can make a blues guitar fan's jaw drop. And, interestingly on this album, he does it mainly in the context of rather short solos. In the tradition of early R&B, most of the tracks on Duke's Blues are under four minutes, though he does allow himself one long, slow blues to stretch out on. Duke Robillard on his new album Duke's Blues underscores his position as one of the finest blues guitarists to emerge from the Baby Boom generation. He's a versatile player who has encompassed everything from hard-edged rock to jazzy swing, and on this album he pays tribute to some of his influences, including his old stomping ground of Providence, Rhode Island. In the process, he has made what I think is the finest album of his 11-year solo recording career. He brings back the sound of Roomful of Blues, the band he founded over 28 years ago, while also incorporating some of the other styles he has performed over the years. Duke's Blues highlights his worthy vocals, while he puts in some exceptional guitar work, creating guitar solos that are gems, especially given the short length of most of the tracks. Pithy is not a word that is usually applied to electric blues guitarists, but Robillard can say a lot in a short time, and when he does stretch out, he never bores. Sonically, the album is very nicely done -- the production is aimed at recreating the feeling of some of the early blues records without the audio imperfections from the early days that some younger performers like to include for the sake of authenticity. Robillard said one of the reasons he went back to Providence was to work with engineer John Paul Gauthier, who did an excellent job. Interestingly the album was mixed in Pittsburgh by one Tom Walsh. 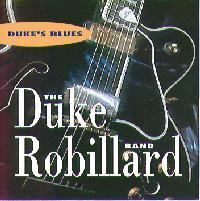 Duke Robillard, now a veteran player, continues to improve with time in the blues tradition. This CD's liner notes make reference to Robillard's influence by others in the past 25 years, and the likelihood that a younger generation of blues players will look to this Rhode Island native as a major influence in another quarter century. As far as I'm concerned, he has already taken his place as one of today's most significant blues guitarists.